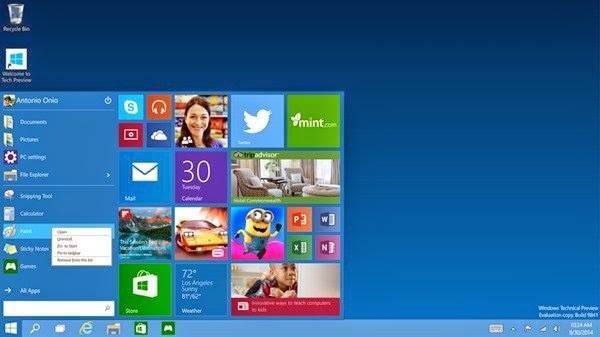 Basically, if your PC can run Windows 8.1, you’re good to go. If you're not sure, don't worry—Windows will check your system to make sure it can install the preview. The easiest way to convert an ISO file to a DVD is to use Windows Disc Image Burner. If you want to stop using Windows Technical Preview and return to your previous version of Windows, you'll need to reinstall your previous version from the recovery or installation media that came with your PC—typically a DVD. If you don't have recovery media, you might be able to create recovery media from a recovery partition on your PC using software provided by your PC manufacturer. You'll need to do this before you upgrade. Check the support section of your PC manufacturer's website for more info. If you're running Windows 7 without SP1, you can only upgrade to the preview by downloading an ISO file. If you install Windows 7 SP1, you can upgrade to the preview by using Windows Update or by downloading an ISO file. If you faced any problem with download link let us know .